What a start to the WFDF 2018 World Ultimate Club Championships! MASON, Ohio — In a much anticipated showcase game between No. 5 seed GRUT (NED) and No. 12 seed Wild Card (USA), the two teams gave the crowd all they could handle, culminating in a three-point run from the Americans to win the game 15-14. A few unfortunate souls abandoned the stands when GRUT scored to make it 14-12, but most of the audience was treated to a nailbiting opener between what are expected to be two of the top teams in the mixed division. “We’ve seen a few of these [showcase games]. It’s really fun to have it be the focal point and have people fired up,” said Wild Card coach Mike MacKenzie. Both teams spent most of the first half pushing a distinct offensive agenda. GRUT set the tone from the first point, granting an acre of space to young star Floor Keulartz, who eventually found room to receive a huck from similarly-aged handler Benjamin Oort. While Wild Card responded with arguably their sloppiest offensive point of the game, they did conclude it with a smooth offensive possession engineered by hard open side cutting and concluded by an upline score. Defenses struggled to gain much traction for most of the game, including in the first half. While there were some defensive plays to be made—like a scintillating Keulartz layout block to retrieve possession after she tossed a floating hammer turnover—many cuts went nearly unchallenged by overeager defenders. Ian Engler and Robin Meyers managed poised possessions for Wild Card. In contrast, GRUT’s offense, centered around Keulartz, Oort, and Walt Jansen, struck deep fearlessly. That trio combined for four assists, six goals, and four blocks in the first half. After some opening sloppiness from both teams, the Dutch O-line donated just one further first half possession to Wild Card, and Boston happily accepted it this time, converting the break opportunity. The Boston offense faltered with a chance to take the lead into halftime, giving up a quick score involving an uncontested foul to tie the game at 7-7 and committing two ugly throwaways on the ensuing offensive point. GRUT’s Tjeerd Ates shot a hammer into the end zone for their first break and to recapture the advantage heading into halftime. Both teams exchanged mostly uneventful holds throughout the first few points of the second half. But with the finish line in sight and a clearer picture of the opposition’s gameplan, both teams turned up the dial on defense. GRUT’s O-line smothered the American offense after two turns, inducing high stall turnovers, which they eventually used to hold to make it 11-10. On the next point, Hailey Alm, one of the most effective players for the Boston offense, put too much float on a break throw, and the Dutch club earned another break to go up by two. 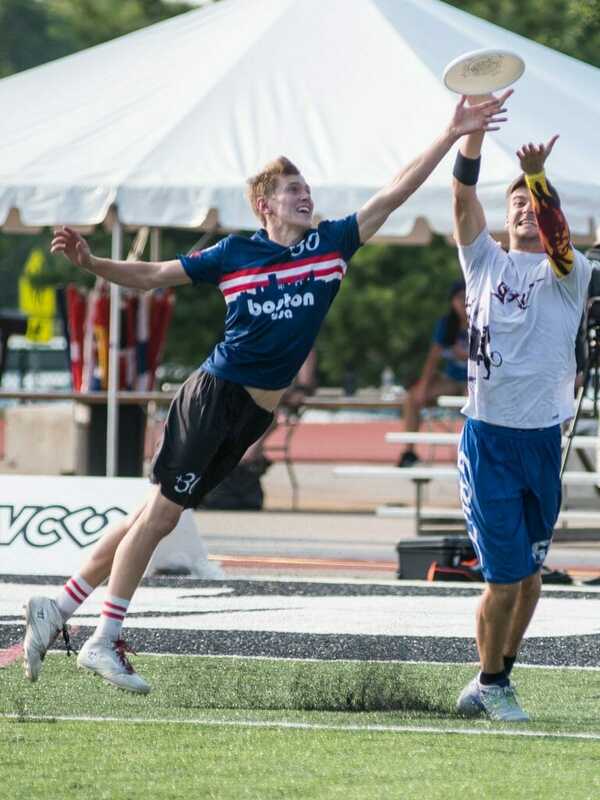 After some trading, the game looked mostly in hand for GRUT, perhaps never more so than at 14-12 when Keulartz soared through the air in her own end zone for a layout block on a Boston huck. While she took an injury sub, her teammates gave the disc right back, and Wild Card locked up the hold. GRUT hung up a huck on their next offensive possession, opening the door for the US team, who walked through with an eventual score for Lauren Nelson from Kyle Johnson from within the red zone. With the crowd’s full-throated support, GRUT received the pull with a third opportunity to win the game.1 Jansen collected a throw near the force sideline and stepped into a forehand huck fake, and while his throwing motion stopped short, the disc kept going, slipping out of his hand to set up Wild Card with a golden opportunity. Boston was at their most patient, moving the disc horizontally, wearing down both GRUT’s legs and their nerve. While Wild Card displayed discipline in an extended red zone possession, Dutch desperation sent their players sprawling for attempted blocks on nearly every American fake. Matthew Heath hit Engler on the open side at the front cone to complete the comeback. In addition, Wild Card began to clamp down on GRUT’s key contributors. Most notably, they held Keulartz scoreless in the second half. Dutch hucks had smaller spaces to navigate as helpful Boston defenders sought to intervene. Wild Card got GRUT at their near-best in what should be a shared experience for the US clubs. MacKenzie explained that he thinks his team will have learned to take no team lightly. There’s not a team from outside of North America that wouldn’t want to be the first to take home the horns of the prized big game from the United States. Both teams are situated in a potentially competitive Pool E, and there are more tests to come. But, for now, Wild Card can bask in the glory of a memorable comeback against a powerful opponent in front of a captive audience. Comments on "Late Comeback Pushes Wild Card In Front of GRUT in Showcase Thriller"